He could have faced up to two years in jail. Instead, Butler sentenced Topham to a six-month conditional sentence with a ban on posting publicly online and a curfew. Topham, a 70 year old grandfather and retired teacher, published RadicalPress.com online from his rural home in Cottonwood, B.C., about 700 kilometres north of Vancouver. Butler ruled that Topham deliberately used the internet to disseminate anti-Semitic information but said the man was not calling for violence. The crown noted Topham had already agreed to shut down his website, a site which remained active for the year after his conviction but was gone before sentencing. Topham also offered to end his online presence. Defence lawyer Barclay Johnson had called on the judge to give Topham a discharge. “My view is that jurors were not convinced,” said the defence lawyer, noting Topham was convicted of only one of two hate crime charges. Johnson described his client as a good teacher, a father and grandfather and a journalist with “controversial views” and a large following. This case was the first hate crime trial prosecuted in B.C. in almost a decade. Topham’s defence fund was backed by Paul Fromm, a self proclaimed ‘white nationalist’ and free speech advocate who travelled from Ontario to attend the trial. Topham’s lawyer argued his client has never been a member of a white supremacy group. 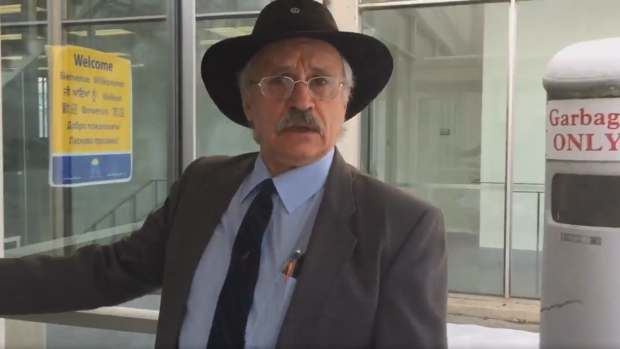 “I felt that I had a duty as a Canadian citizen to alert the general public of an imminent threat … the interests of the Jewish lobby,” said Topham in court Monday. ​Topham’s constitutional challenge of Canada’s hate crime laws was dismissed in February. You are currently browsing the Mystery Worshiper's Blog blog archives for March, 2017.